SomeGuy Remove Trap, the tech that most Dragon based decks run in their sideboard. Right now, the only big reason for Remove Trap is to get rid of Dragon Capture Jar. If your not playing a Dragon based deck then Remove Trap can be a completely useless card. It might work against someone who plays Ultimate Offering, but by the time you Remove it, it will most likely be too late. One things for sure, you never want to play Remove Trap in your maindeck for the sheer fact that your opponent will probably not have anything that you could target with it. We once again reach a card that had great potential, but, at least in the current environment, falls short. 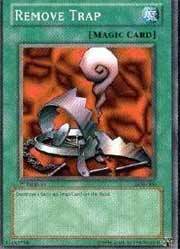 This nifty little card will destroy any opposing face-up Trap card on the field. Why isn't it that useful right now, though? The only Traps this card work on are Permanent/Continuous Traps. All of the rest of the Traps can't be destroyed by Remove Trap due to the Trap cards' advantage in spell speed (they are 2 and 3, while Remove Trap is 1), so chaining doesn't work. The only two Permanent Traps in play so far are Dragon Capture Jar and Ultimate Offering. We'll leave Ultimate Offering out of this discussion, because Ultimate Offering should not be destroyed if it can benefit you as well. Let's talk Dragon Capture Jar. Most people use Lord of D. as a protection against this. I hate to burst your bubble, but you've been playing incorrectly. According to Edo's English Expert Rules Page (http://www.stormpages.com/edhrzic/Expmon.htm), Dragon Capture Jar does is not affected by Lord of D., because Lord of D. only protects against effects that target one monster. Since Dragon Capture Jar simultaneously target all Dragons in play (and that can be more than 1), it is not affected by Lord of D.
With this little critter, that Jar is shattered. Sadly, that's the only use for this card right now, and probably its only use, as soon, we will get the infinitely better Cyclone. Remove Trap + Dragon Capture Jar = Release the dragons! All non-Continuous Trap cards: Since they will spend all of their time face-down, they will not be affected, and they can't be destroyed when they are activated due to their higher spell speeds. Nah. No one will play Dragon Capture Jar in casual play. Heck, you'll be lucky to see a serious Lord of D. deck here, thus making Remove Trap worthless. I suppose it's necessary to throw a couple of these into a Lord of D. deck, just to eradicate those idiotic DCJ. If you're playing a Lord of D. deck, use it. Otherwise, stay far, far away.